The beginning of 2012 presents a landscape filled with both challenges and opportunities for the Alliance for a Clean and Healthy Maine (ACHM), of which MPA is a proud member. The Alliance hopes to build off of some significant victories achieved during the 2011 legislative session, to defend key environmental regulations that protect Maine and its citizens and to move forward with priority issues on both the state and federal level. 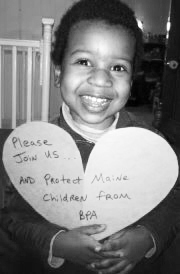 Despite being in the crosshairs of Governor LePage's attempts to roll back environmental legislation in 2011, Alliance partners, including MPA, launched a targeted grassroots campaign aimed at defending vital legislation related to toxic chemicals in children's products. Mainers deserve to know that the products on our shelves are safe for our children and, with the help of thousands of Mainers speaking out, We not only defeated an attempted rollback of Maine's Kid Safe Products Act (KSPA) by the chemical industry, but strengthened its provisions and began the phase-out of the dangerous chemical Bisphenol A (BPA) from children's products in a nearly unanimous vote in the Maine Legislature. This year MPA and allies are working to continue that momentum by closing a loophole that allows corporations to decline to report the presence of BPA in their products, instead labeling it a “contaminant.” In order to stop this end run around the law, Maine people will once again have to show out-of-state corporations that putting profits before the safety of their customers will not be tolerated and that Maine's government listens to its citizens, not industry lobbyists. Work is also under way to expand the list of products covered by the KSPA to infant formula and baby food containers. It is simply common sense that these products, marketed to the most vulnerable among us, should be BPA free. This Valentines Day hundreds of Mainers from all over the state gathered at the Maine State House for the “Love Maine” rally, to show support for legislators who want to protect Mainers and their kids from harmful household products. With the launch of a statewide letter to the editor campaign, the help of expert testimony and personal calls and letters from hundreds of Maine families ACHM hopes to show that the safety of Maine children is a bipartisan issue that people and legislators from all political persuasions can support by coming together and doing the right thing for our state. MPA's work to protect Americans from toxic chemicals also continues on the Federal level with the reform of the Toxic Substances Control Act, the broken federal legislation that is supposed to regulate the use of chemicals in consumer products. Despite being meant to regulate an estimated 60,000 chemicals that are found in every day household products, only 200 chemicals have ever been tested and even substances known to be deadly, such as asbestos, have never been properly contained and regulated. Last year, Senator Frank Lautenberg introduced The Safer Chemicals Act for consideration by this year's Congress. After MPA and our allies delivered thousands of letters and postcards from across the state to Senators Olympia Snowe and Susan Collins, both Senators announced their support for the bill, which would reform the outdated legislation that has never adequately protected consumers. ACHM is continuing to work with both Senators, as well as Maine's two Democratic Representatives Mike Michaud and Chellie Pingree, as well as state and legislative leaders, to move this important piece of legislation forward. Why are Mainers allowed to know what ingredients go into their food, but not what is in the container the food comes in? Why are harmful chemicals labeled as dangerous when they are in products such as motor oil, that go in cars, but not when those same chemicals are in face lotion, which is applied directly to human skin? Maine has been an environmental leader since the days of Rachel Carson and Edmund Muskie and the Maine People's Alliance is working to continue that proud tradition into 2012.